The forecast thunderstorm most certainly arrived yesterday. However, we didn’t get the forecast hail and only a short burst of wind. We did get some very spectacular lightning and thunder, which lasted from about 4.00pm to 4.00am – and RAIN!!! By 5.00pm the park was filling up again with overnighters and the Tasmanians we had met at Yamba (my ex-workmate and his wife) pulled into the site next to us, so we ended up talking for most of the evening. It was still raining when we packed up this morning and only stopped for a short while until after lunch. Unfortunately, the temperature also dropped. Yesterday at noon it was 31 degrees, today at noon it was 11 degrees. A big hard to take. When we left Tamworth this morning, we headed for Wallabadah, a small town (about six houses) with a memorial garden to the First Fleet. This memorial is at Wallabadah because no where else in NSW was interested. Work is still in progress, but it was certainly worth a visit. 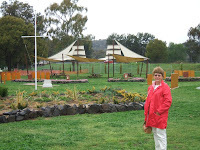 Then we headed to Gunnedah, driving past lots of canola fields in full flower – fluorescent yellow in the rain and gloom. We also spotted an emu among some trees near the Oxley Crossing (Oxley stopped here in 1818!). Our lunch stop was at Coonabarabran (in the rain) before travelling to Gilgandra for an overnight stop. We are in a lovely park beside the river, nice and grassy with huge drive-through sites and very friendly managers. It is also right beside the Newell Highway… It didn’t really take long to drive round the sites of Gilgandra, but we did spend some time at the Visitors’ Centre which had some very good exhibits, especially on the Coo-ee March in 1916 (Google it if necessary! ).